The newly-renovated Embassy Suites Baton Rouge hotel is located near the campus of Louisiana State University - LSU, the Mall of Louisiana, the LSU Rural Life Museum and the Pennington Biomedical Research Center. 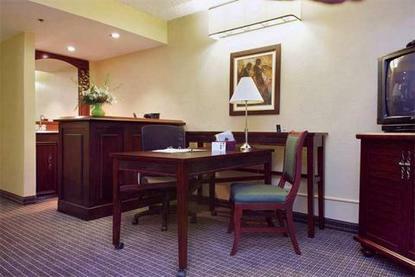 This full-service upscale all-suite hotel is just minutes from Downtown Baton Rouge, the USS Kidd Veterans Memorial and Museum, the Louisiana State Capitol building, the Louisiana Governor's Mansion, the Louisiana Art and Science Museum, LSU Tiger Stadium, LSU Alex Box Stadium, the Baton Rouge River Center, the LSU Museum of Art, the LSU Museum of Natural Science, the Pentagon Barracks, the campus of Southern University Baton Rouge - SUBR and the Baton Rouge Metropolitan Airport. The Greater Baton Rouge Zoo, St. Francisville, the Audobon Golf Trail, the Port Hudson State Historic Site and the Nottaway Plantation and Oak Alley Plantation Antebellum Homes are all just a short drive away. Guests of the Embassy Suites Baton Rouge hotel stay in spacious two-room suites and receive a complimentary cooked-to-order breakfast, a nightly manager's reception and high speed internet access. The hotel offers a complimentary shuttle to the Baton Rouge Metropolitan Airport upon request.